Where are haunted houses? By this I mean, in what kind of setting is one likely to find a creepy old house with ghostly shenanigans? Usually such houses are found in the countryside. Maybe they are surrounded by woods. Perhaps there is a nearby graveyard or two. Or they rest on the peaks of mountain tops. Heavy thunderstorms add to the eerie environment. Snowstorms trap haunted house inhabitants and seal them away in closed quarters. How about a haunted house on an ocean beach? Hmm, sounds a little out of place. Beaches have sunrises and sunsets; the beautiful orange ball of light that makes its way across the sky is hardly a magnet for ghosts. They have calming breezes and welcoming waves. They are sandy spas of salt baths and sun tanning. They are – dens of spiritual activity? Really? What’s a scary ghost like you doing at beach paradise such as this? 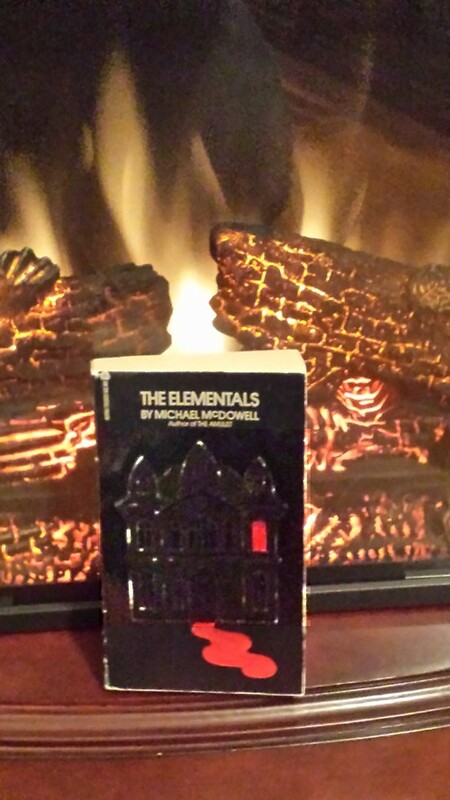 The panhandle beaches of southern Alabama are the perfect setting for haunted houses; at least the beaches that spill out of the creative and macabre mind of Michael McDowell and into his book The Elementals. Okay, let’s narrow it down to one fictional beach in particular – Beldame. It’s a secluded area on a spit that extends off of the Gulf coast. It harbors three Victorian houses. These houses are reachable only via certain modes of transportation, such as a boat by way of water or a dune buggy by way of sandy terrain. At night it gets very dark. In the pitch black night, sometimes the only sign of activity comes from the sounds of the surf. But there are other things stirring, such as the elementals – spirits that have no form. Beldame was the host of many summer retreats for two wealthy families linked in marriage and friendship. The grown children of The McCrays and The Savages remember their childhood summers at Beldame with a strange mixture of nostalgia and apprehension. It has been a long time since they have spent significant time at this hideaway. After the death and disturbing funeral of matriarch Marian Savage, they decide to revisit Beldame. Dauphin and Leigh Savage occupy one house with their maid Odessa. Luker McCray (brother of Leigh) lodges in the second house with his thirteen-year-old daughter India and his mother Big Barbara. The third house remains unoccupied (or does it?). It is uninhabitable – a large sand dune was swallowed a third of the house. Out of all the inhabitants, it is Luker that is most apprehensive about the third house. His sharp daughter senses his fear. India soon learns that the third house is a depository of childhood fears and frightful memories for other family members as well. It has its stories. Too curious for her own good, India climbs the third house’s encroaching sand dune and peers into the bedroom window of the second floor. She sees things. Scary things. This is a very captivating book. There are many things to love about this story. As an analytic reader, I noticed two themes in particular that captured my interest. The first has to do with the constantly shifting terrain. The families are surrounded by sand dunes; their shapes and heights varying depending on whatever forces of nature happen to be at work at a particular time. There exists the threat, perhaps not always evident to the fictional families but surely apparent to the readers, of being overcome by the dunes; of their homes going the way of that mysterious third house. Then there are the high and low tides that alter the state of the nearby lagoon. During high tide, the lagoon maroons the houses and Beldame becomes an island. Things are in constant transformation. Nothing is as it appears – not for long anyway. Whatever it is, soon it will be something else. The third house. Things are not always the same with it. The sand drifts, both within and without, change. The furniture appears to change from one viewing to the next. Sometimes bedroom doors are shut and locked. Other times they are unlocked and slightly ajar. And how about those spirits within! Sometimes they are the spitting images of lost loved ones. Other times they are grotesque abominations of things that resemble humans. But in their natural state they are indeterminate in form and structure, their “shape” subject to environmental forces. These forces are the fears, memories and overall personalities of those that come within their lair. Likewise, Beldame is a place where memories and dreams become blurred. Looking back at summer vacations past, some characters have trouble distinguishing whether certain things they had witnessed actually occurred of if they were only the byproducts of dreams or imagination. The nature of reality is in constant question. Reality seems to shift, change shape, just like the dunes of sand. The sand, the wind, the storms, the tides…and spirits = elements that play a role in transforming the terrain; elementals. The second theme concerns the surrealistic nature of Beldame. It is a magical place – a coveted haven. The history of Beldame is a history of tragedy at the expense of the The McCray and Savage families and yet they all seem to share a certain unexplainable nostalgia for their land on the spit. Time seems to stop when they stay in these houses along the ocean side. The have no clocks, they follow no schedule. When the sun is right they lie on the beach. When the sun is to strong they seek shelter in the house. They live day to day following the lead of elements. Their occupational worries disappear. And yet, it seems as if Beldame is a place to go to die. Perhaps it is like an outpost of the netherworld –timeless, tranquil at times, spiritual, and of course, deadly. On top of all this, The Elementals also serves as an anthropological account of well-to-do southern families. The characters are filled with life and beautifully tarnished with quirks. Their expressions are humorously raw. According to Vicki Brunson of Examiner, the book had been “out of print for years”. The book I borrowed was a used copy that my friend purchased from Amazon. However, it appears that The Elementals has been re-released through its publisher Valancourtbooks. Sadly, author Michael McDowell passed away in 1999. He is a favorite of Stephen King and the writer of famous screenplays such as Beetlejuice and The Nightmare Before Christmas.